One mantra for staying organized is to “keep like things together.” This is a key rule for the kitchen. I’ve got drawers designated for my food storage containers, a cabinet for spices, and a spot for making tea. I’m a daily tea drinker so one small cabinet contains tea, honey and the sugar bowl. My most-used tea stays in a small bin (made for kitchen cabinets), which I can pull down to select which tea bag I want. This tea cabinet is next to a larger cabinet with all the mugs and more specialty teas. On the counter underneath is the electric kettle and the tea pot, sitting on my favorite plastic tray. 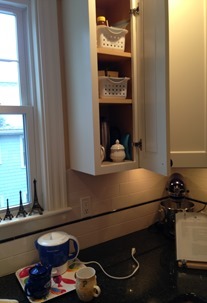 By keeping items on the tray I can quickly move the tea pot and kettle to a different area if I need more room on the counter. Need help with your kitchen? We can weed through the clutter and create a space you’ll love. Contact me today to get started!